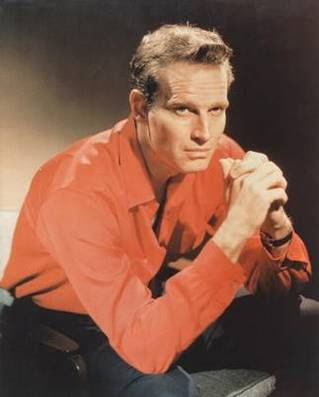 When I think of Charlton Heston I think of Will Penny and Steve Leech, Brad Braden and Barney Benson, Judah Ben-Hur and El Cid, Buffalo Bill Cody and Andrew Jackson, Michelangelo and Moses, Taylor and Det. Thorn, Cardinal Richelieu and Brigham Young, Inspector Vargas and Sir Thomas More. I think of the lonely child and the shy young man who found a life to live and a wife to love in the theatre. I think of the thoughtful, observant writer who treasured and shared his memories. I have never personally been a huge fan of Heston, but I have to say that your post is a very classy tribute to this fine actor. Nicely done, CW. Well said. I remember different things. But I'm less classy, so I'll keep my mouth shut. Caftan Woman, your concise and thoughtful reflections on Mr. Heston's career show the scope of his artistic work. That was beautifully written. Mr. Heston is my idol/hero/rolemodel. He was an angel in life and is now an Angel in Heaven watching over his beautiful wife and kids from Heaven Above. A truly beautiful person he was. Great tribute. So many great roles, Will Penny isn't mentioned enough, another good one was "Long John Silver" in Treasure Island.